Hej hej! I'm always inspired by makers spaces. There's always something unique and personal about them, don't you find? 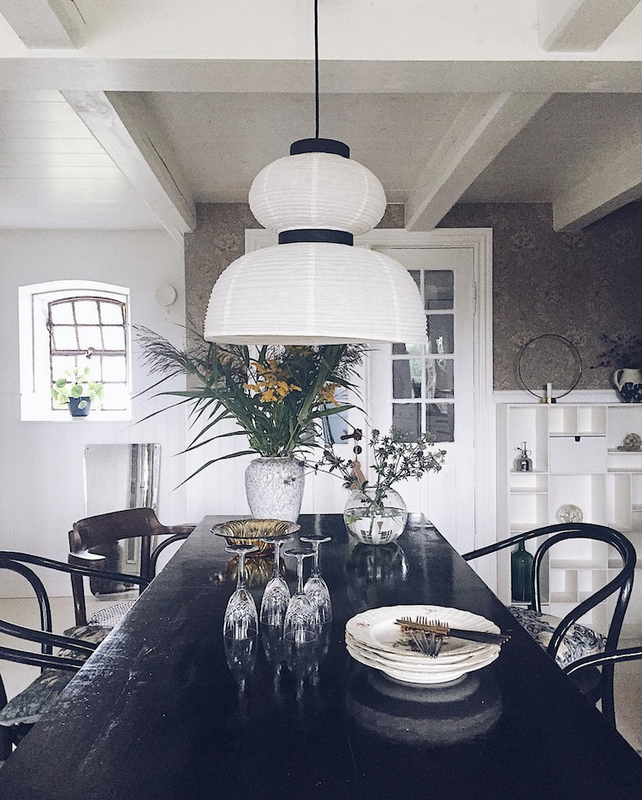 The Danish home of Eline Engen is a fine example! 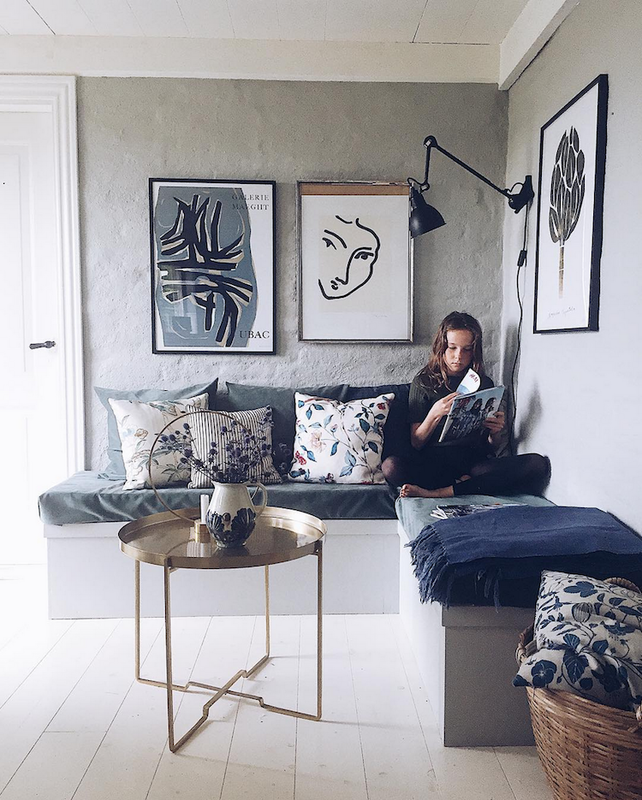 Eline lives in a beautiful 200 year old house on the North coast of Funen, Denmark with her husband Brian and children Gustav (14) and Clara (12). 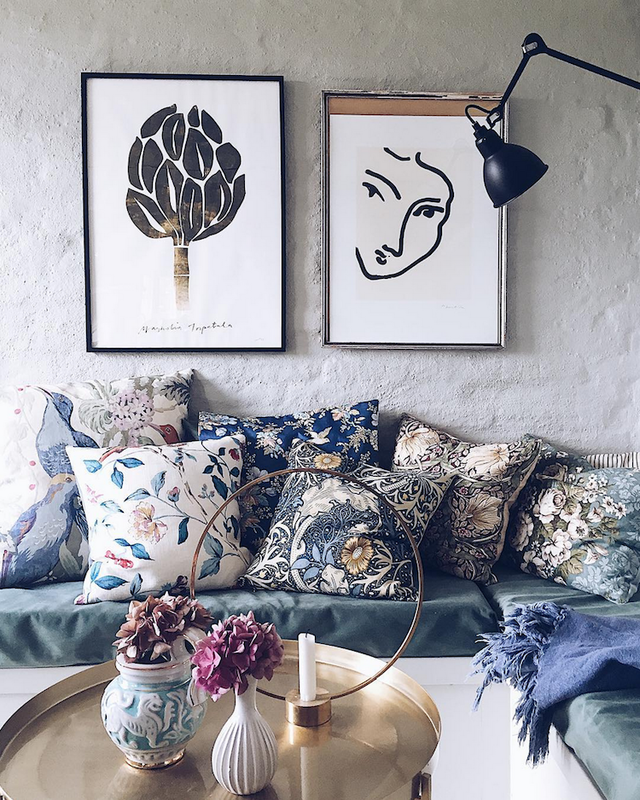 Eline works part time in an interior shop and spends the rest of her working hours creating and selling beautiful cushions and clutches made from vintage fabric and textile remnants. 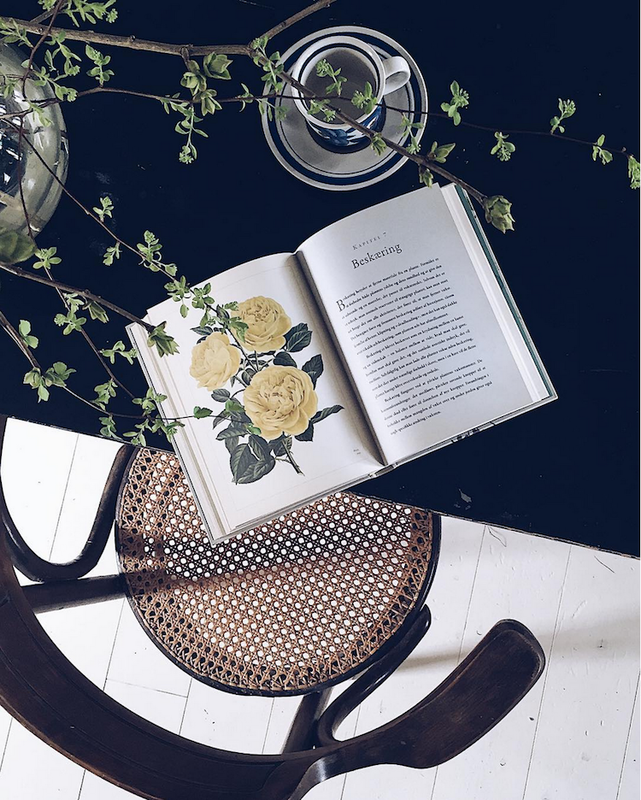 Eline describes her home as "very relaxed with lots of textiles, plants and treasures which have been collected over time." 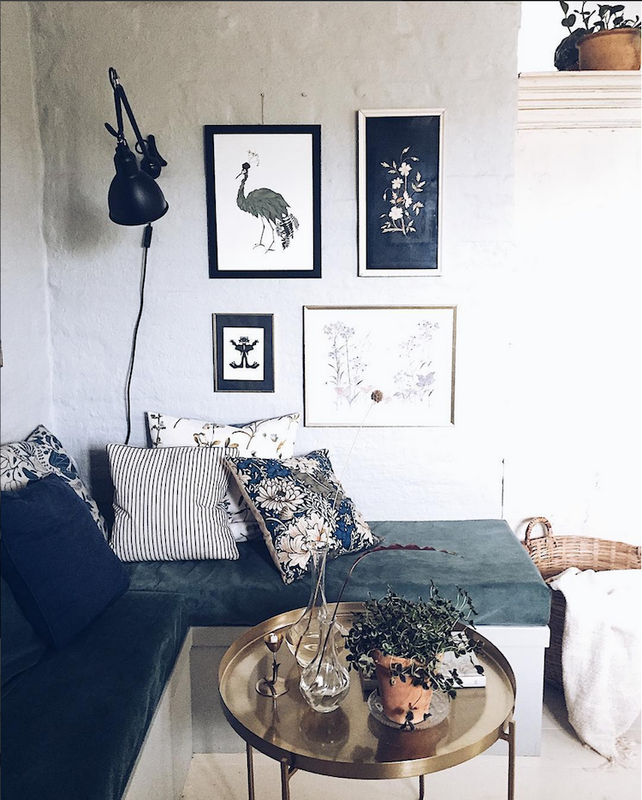 She has a passion for all things vintage, soft colours, and beautiful patterns which she combines with modern pieces in her home. Enjoy the tour! 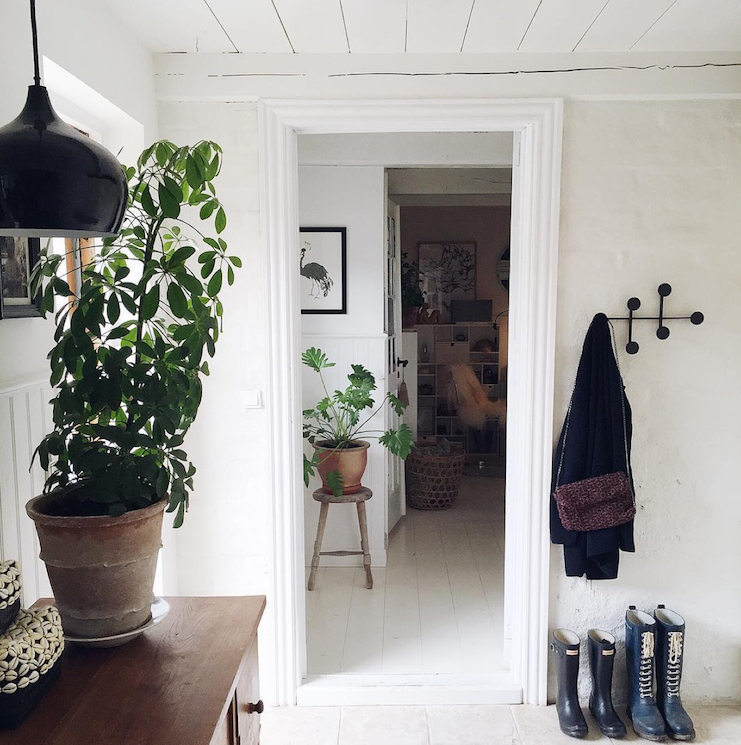 What a charming, warm and inviting home, don't you think? 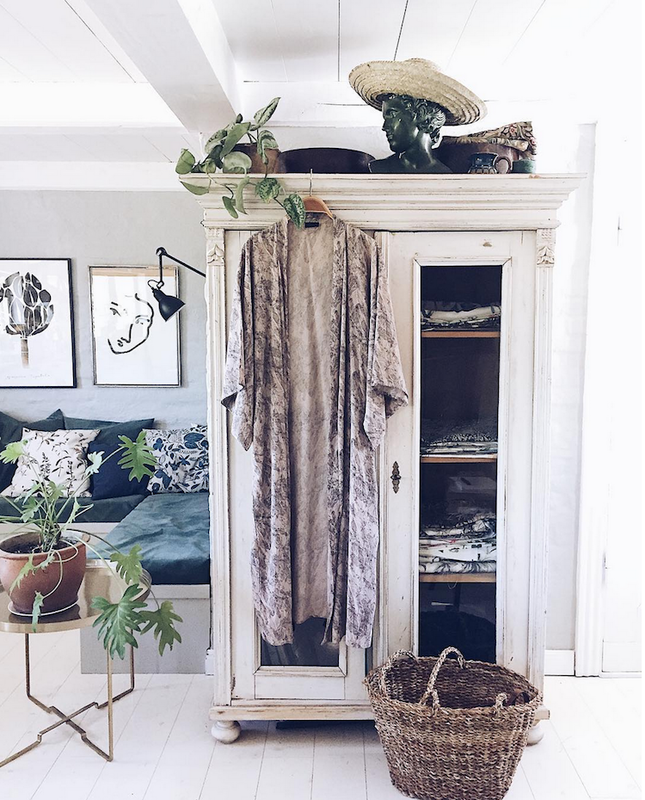 There are so many treasures, but Elin tells me her favourite is the old cabinet where she stores all her vintage textiles before turning them into cushions and clutches. 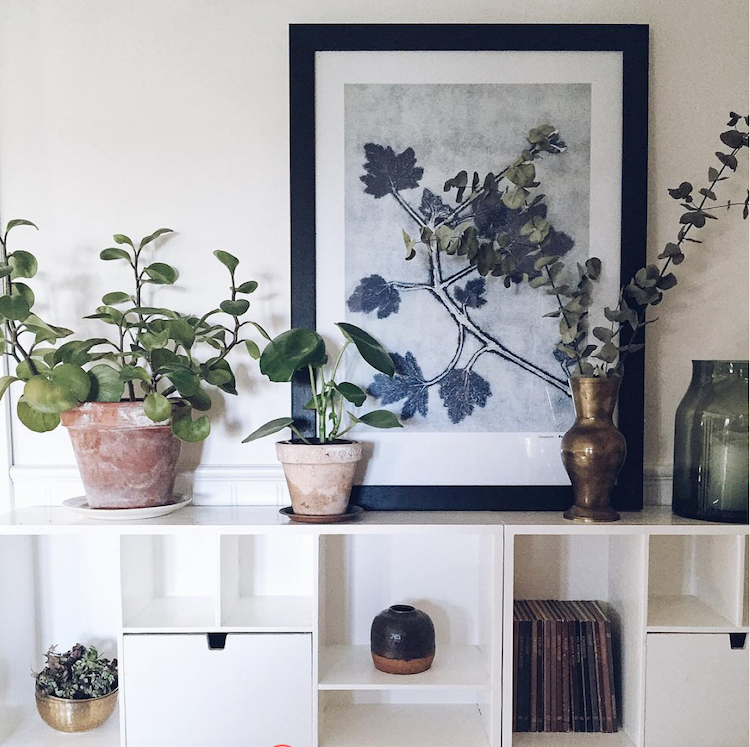 When it comes to decorating, Elin advises to "stay true to yourself. It's a cliché but true. Surround yourself with items that mean something to you. Do not buy just to buy. 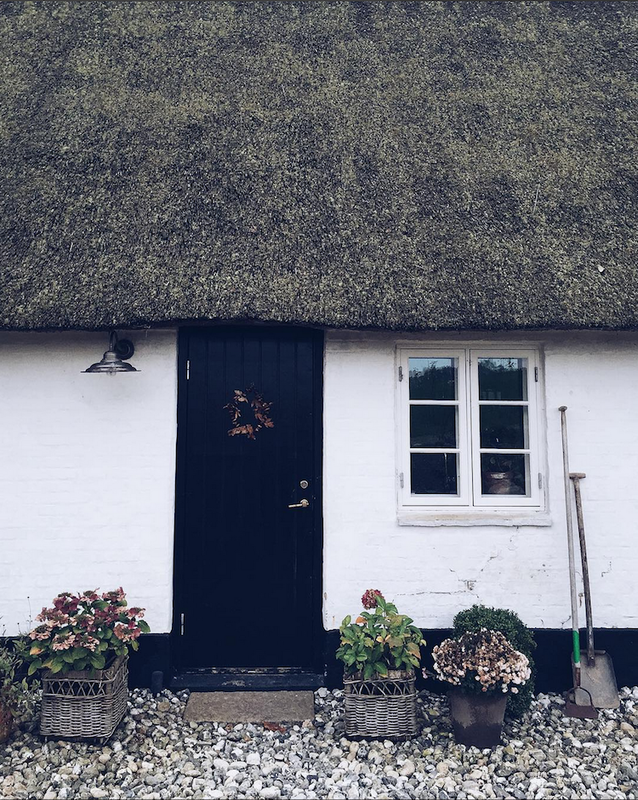 A home is a real home when it reflects the people that live there and when everything is not perfect." Wise words indeed! You can pick up Elin's pretty cushions and clutches over on instagram. Sitting room area: poster to the left from Stilleben and to the right Retro Villa (pretty shop alert! ), cushions handmade by Eline, Klong halo candle holder (love this), Scarlet Kimono from Lulu's Drawer (another 'love' from me! ), Lampe Gras. Dining room: Era armchair with cane seat, cushion on chair handmade by Eline. 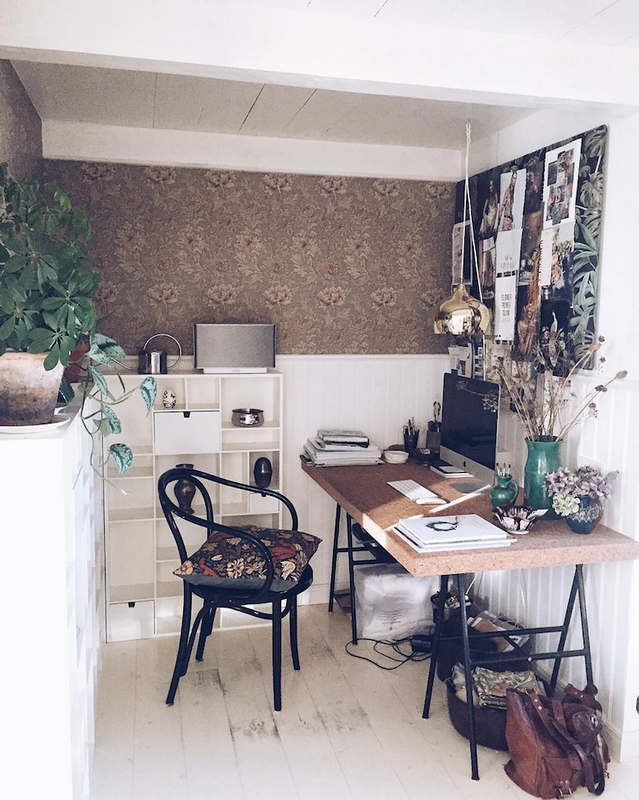 Office: William Morris wallpaper, Sinnerlig desk from IKEA. Thank you so much for the kind permission to show the pictures of your home Eline! On a completely seperate note, I'm having so much fun in Paris for the launch of my Lagom Book in French. Last night HaperCollins France planned a wonderful cocktail party and I met the English to French translator and Aude, the designer behind the pretty front cover, among lots of other inspiring people, what a great evening! Merci beaucoup! The man is arriving this evening and we're going to spend the weekend here - yaaaaay! Hopefully see you tomorrow at Galeries Lafayette for the book signing and DIY session if you're in town (4 - 6 pm)! I hope you've got some nice plans? 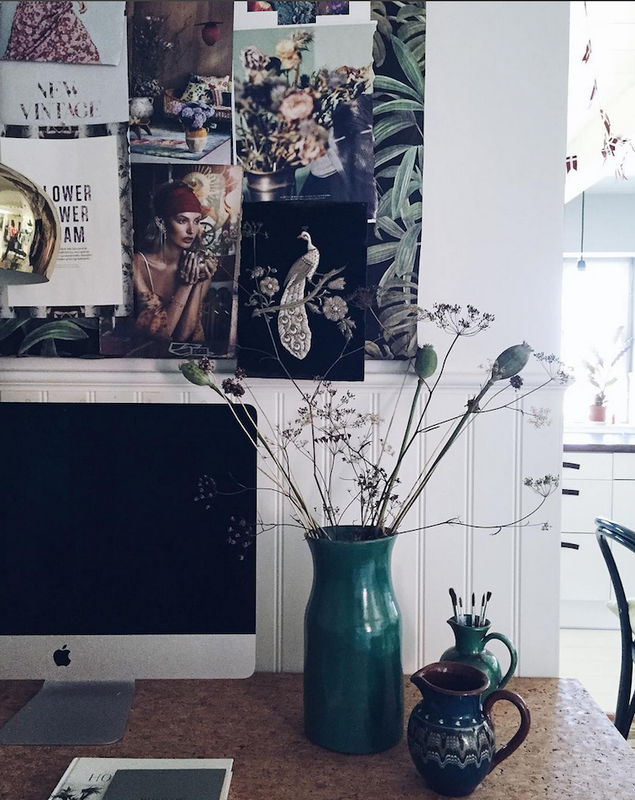 Lovely home and textiles! 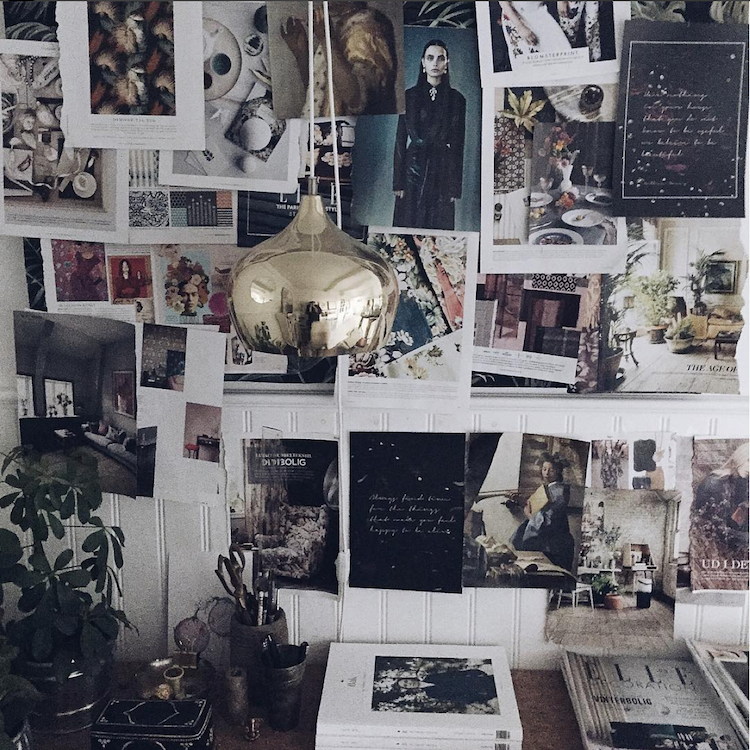 Such great advice to surround yourself with what you love vs. just buying! I find it goes with the idea that our homes constantly evolve and so are never really finished. Currently reading your new book: Lagom. Love it! Done! Thanks for asking- I hadn't thought about it!